Playing at the Capitol Theatre until 8 May Fiddler On The Roof is a much loved musical that has been enchanting audiences for more than 50 years. 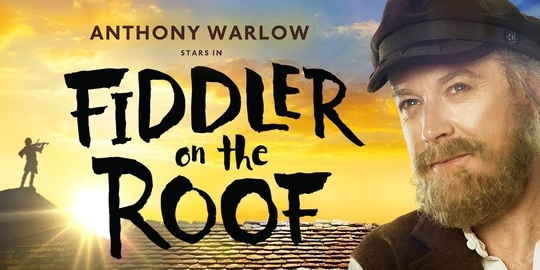 Anthony Warlow as the poor milkman and father of five daughters Tevye is without doubt the star. He injects humour and pathos into his performance and his soaring vocals are worth the price of admission alone. Sigrid Thornton is a good physical and theatrical match as his wife Golde but her vocals are quite weak. The cast have great voices but seem to struggle with the unusual accents. The set design is clever in its simplicity and very evocative of the poor Russian hamlet Anatevka. The first act moves quickly and contains highlights such as If I Were A Rich Man & Matchmaker, Matchmaker, The second act is shorter but heavier with a dark undertone as the Jewish families are displaced and seek new lives elsewhere. The underlying theme of love and the capacity to forgive is demonstrated by Thevye weighing up the pros and cons of the relationships of his elder daughters. Tradition and community is all well and good but we all need to adapt to changing times. I enjoyed the show but not being familiar with the story found the conclusion unsatisfying. I would recommend taking mothers and grandmothers for a Mothers' Day gift but leaving young children at home as I think they would find it boring. When: Tuesday-Thursday 8pm, also Wednesday 1pm, Saturday 2pm & Sunday 3pm.